This is not the Writing About Writing Cheese Guy. 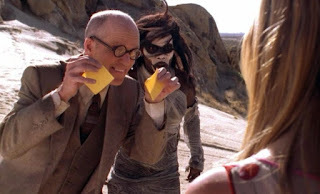 This is from a Buffy the Vampire Slayer episode called Restless. But very close. This is our latest entry for the Writing About Writing Staff page. Text has already been added there. When we moved into the WOW compound we found the cheese guy already up on the second floor. Apparently he just lives all alone up there with his cheese. Since we haven't even moved beyond needing more than the first floor, we decided to just leave him alone. Sometimes he comes and shares cheese with us, but usually he's just up there by himself. The weird thing is, we don't know how he gets the cheese. None is ever delivered. It's not like we wouldn't notice a dairy on our second floor. And yet he constantly has a wide variety of fresh and stinky cheeses. We tend to see him a lot more when the articles are really flowing around here. Above him (on the third floor) lives a velociraptor with a head mounted laser system. Because the Sci Guy was bored one day.